The Air Jordan 6 “Maroon” Returns This Year! Jordan Brand's 30th anniversary never ceases to disappoint. This year has already been packed full of great releases, and to add to that is a classic rendition of the Air Jordan 6. The Air Jordan 6 “Maroon” is returning this Holiday season, and it will come equipped with Nike Air on the heel! We all know how important that "Nike Air" logo is, so check out the photos above for a closer look. 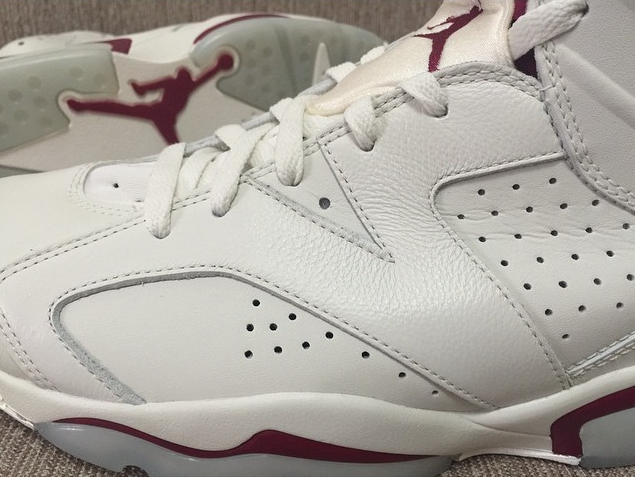 The Air Jordan 6 “Maroon's" appearance consists of two colors - White and Maroon. White leather covered the entire sneaker's upper while maroon accenting on the tongue, heel, and midsole gives the sneaker its nickname. As a finishing touch, the sneaker is complete with a translucent sole. There is no release date set for the sneaker yet, but they are rumored to retail for $190. Stay tuned to SneakerShouts as we keep you in the loop.